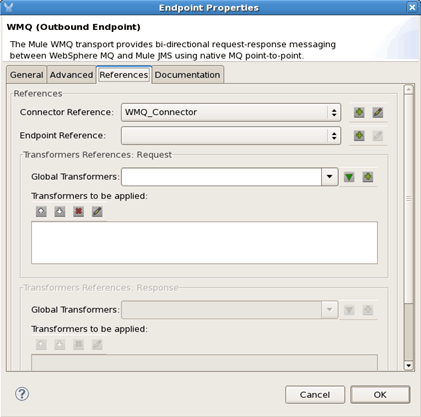 Part 3: Publishing the message to a WebSphere MQ Queue. Then, add a WMQ endpoint inside the Async flow. 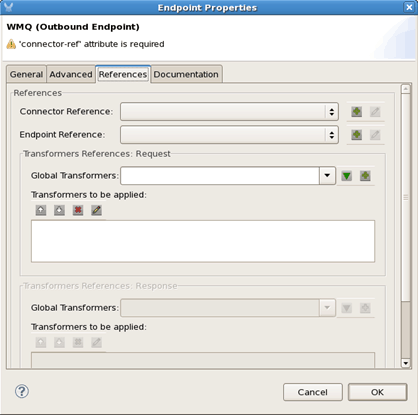 Double-click the WMQ endpoint and specify a Queue name of QUEUE1. Click the References tab and add a Connector Reference by clicking the + icon. 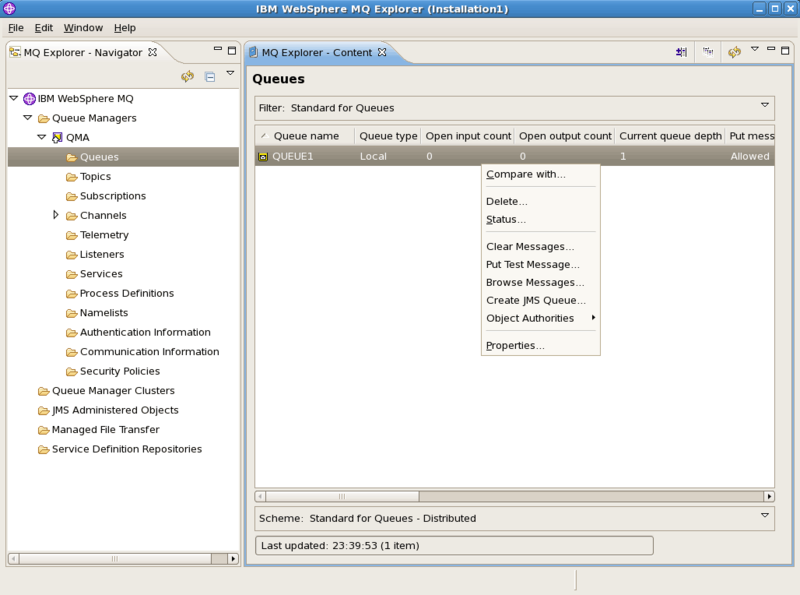 Run the previous SOAP UI test again then open MQ Explorer. You should now see a message in QUEUE1. 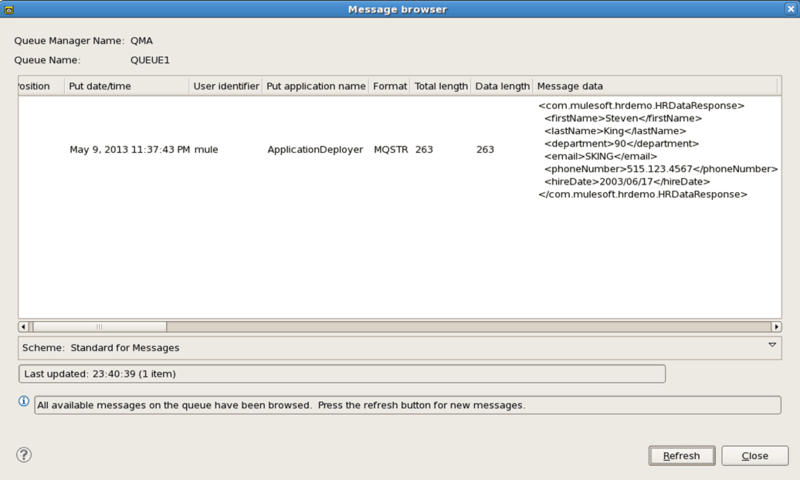 Right-click QUEUE1 and select Browse Messages to see the XML message sent by Mule ESB. As we’ve seen previously, it is very easy to create services with Mule Studio – whether plain HTTP Services with JSON or SOAP-based Web Services. It is also very easy to orchestrate existing on-premise systems like the Oracle Database and IBM WebSphere MQ as part a Mule message flow. In this 3 part blog, we were able to accomplish service creation, data transformation and service orchestration, all without any coding. Instead of coding, we made use of Mule ESB’s building blocks like the HTTP endpoint, the SOAP component, the Data Mapper, XML and JSON transformers and the WMQ endpoint to rapidly develop a flow. Mule ESB also provides several Cloud Connectors to allow you to orchestrate cloud-based systems like SalesForce.com along with your on-premise systems, which I’ll target for a future blog. That’s it for now. For more on Mule, check out: http://www.mulesoft.com/. Complete Part 1 and Part 2 of this Blog. Setup a Queue Manage named QMA and start it up. Create a Queue named QUEUE1. 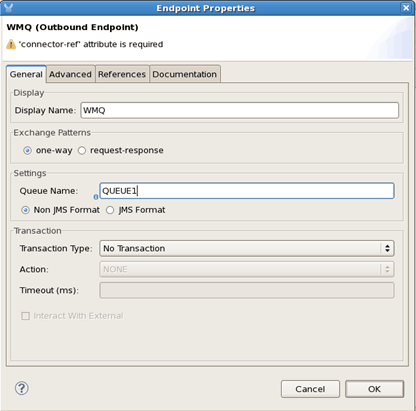 Verify in MQ Explorer that you can access QUEUE1 . 1. I am using home premium. 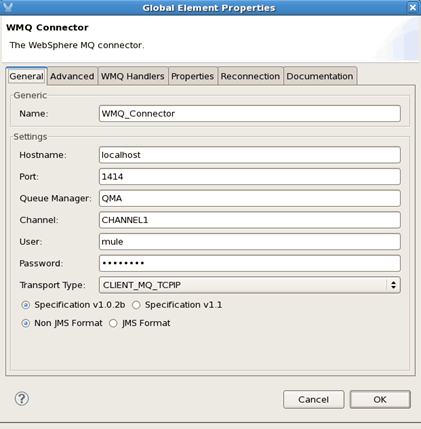 I don’t see any domain name while installing WMQ. So do I need to give channel name, user and pc? 2. I see Object to XML. Which generated class should I specify? 3. If the above are added, it would be complete and helpful for new Mulers. 1. You need to run additional steps to set up the MQ Channel, Listener as follows. (note, ‘mule’ is my Linux OS user, just replace with yours). Then you can use the host name localhost, port 1414, channel name CHANNEL1 and your username. 2. You can leave it with the default (blank), its going to generate the XML based on the Object structure. 3. Thanks for the feedback! Much appreciative. Nice article. Keep us posted on managing in Clusters under tomcat servers please. Nice article. 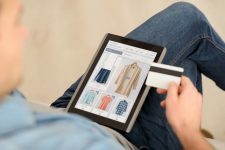 Do you have more information for best practices around using real time API’s like from Sales Force and large data sets?